When Jean-Michel Cousteau was seven years old, his father, world-renowned oceanographer Jacques Cousteau, strapped a scuba tank onto his back and pushed him overboard. That was the first time Jean-Michel opened his eyes to the amazing world that lies under the sea. Seventy-three years later, he’s still just as fascinated with the ocean. Like his father, Jean-Michel has made it his life’s mission to educate the world about the importance of water and the detrimental effects humans have had on aquatic ecosystems. His most recent effort is Wonders of the Sea 3D, a feature documentary nearly four years in the making. His son Fabien and daughter Céline also worked on the film, carrying on the family legacy. Here, Jean-Michel explains the challenges of shooting the film, why he advocates for ocean health and what it’s like to carry a famous last name. We used new equipment that allows us to show the public the slow-motion behaviour of up-close creatures in a way that I haven’t seen in all my years of scuba diving. This was very exciting for me, but making a documentary like this takes a long time. There were several shooting locations in the Pacific Ocean, several locations in the Atlantic and then we went to the Caribbean Sea. You have to find a subject and set up tripods and all the equipment to get the right lighting. Then, you bring the images to the surface, you look at them to see if they’re good, and if they’re not good, you go right back down to do it again, and again. That’s why it took three and a half years to film! People always ask me, “What was your best dive?” and I tell them, “The next one.” And it’s true. Every time I go diving, I see something I’ve never seen before. Whether it’s a new species, a new behaviour of a species or a plant that has potential new applications as a pharmaceutical product, I’m always fascinated. My curiosity drives me to see things I’ve never seen before and share them with the public. I’ve never stopped and I never will stop. There are a lot of differences between when I first started diving and now. The quantities of fish have been reduced, and some species have even disappeared. The catastrophe that is the uncontrolled emission of carbon dioxide has not only increased the temperature of the ocean but increased the strength of storms, hurricanes and natural disasters. The acidification that has occurred in places like Florida has caused up to half of the coral reefs there to die. Coral is critical for hundreds of species that rely on it for food, protection and reproduction. When the coral is gone, those species have no place to go. We are the only species that has the privilege to decide not to disappear. Every human being and every plant and animal underwater and on land depends on water to live. When you drink a glass of water, you are drinking the ocean. When you ski, you’re skiing on the ocean. All water cycles back into the ocean, along with everything we put into it. I don’t just mean plastics, which is a big problem, but also the chemicals and heavy metals we use. We need to be aware of what we’re putting into the ocean. To be a Cousteau means to have a mission. When I was a kid, my father always told me that people protect what they love. And I would say, “Yes, dad, but how can you protect what you don’t understand?” Today, there are a lot of things we still don’t understand. There are thousands of species in the ocean we have yet to discover, so how can we protect them? We have to explore and share with the public as much as we can, and our family is never going to stop. Just like me, my children were in the ocean at a very young age. 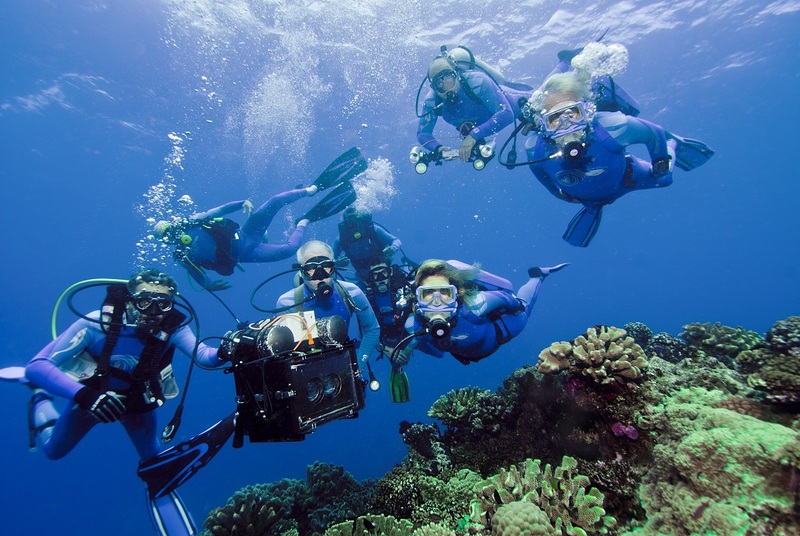 Their entire lives are dedicated to protecting the environment and the ocean and exploring different parts of the planet.